An Android or Apple mobile device with a communication app for people who have difficulty speaking, such as an iPad with Proloquo2Go, is not a new concept anymore. However, insurance paying for a mobile device with this type of software is not as commonplace. A little over a year ago, Saltillo came out with the NovaChat, a Samsung Tablet and/or Media Player enclosed in a hard-shell case with an external speaker and a sophisticated communication app for both children and adults. The NovaChat comes in a “dedicated” model, which means the device can only be used as a communication device and all of the “tablet” features such as access to games, Hulu+, and internet are locked to the user. When a device is “dedicated”, it is considered appropriate for coverage by some insurances, state Medicaid programs, and Medicare. These particular devices currently fall under HCPCS code E2510 for billing purposes. Once the person has the device in their possession, they can purchase an unlock key from the manufacturer, which is not reimbursable by insurance, and have access to all of the features of the tablet. The NovaChat comes in three sizes based on Samsung’s 5,”, 7″, and 10″ tablets. 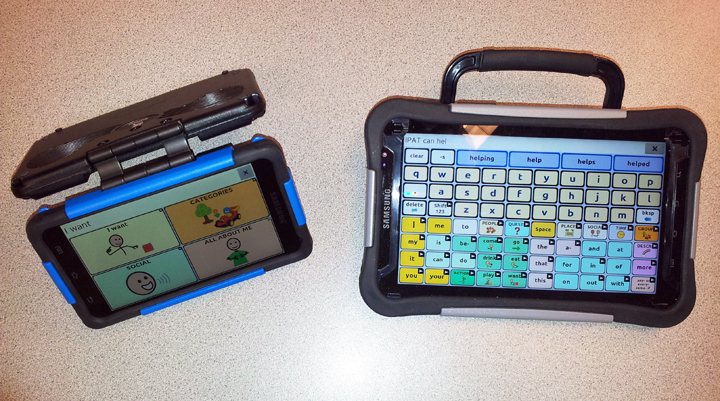 The 5″ model can be accessed by the touchscreen, while the 7″ and 10″ models also allow for 1 & 2 switch scanning. Check out these YouTube videos of everything from the clothes dryer test (Don’t try this at home!) to how the device actually works. From the app to the case, the NovaChats are definitely worth consideration when looking for a communication device. We have the NovaChat 5 and 7 at IPAT for demonstration or short-term rental. Contact our office for more information: 1-800-895-4728.